ThinPrint Mobile Print complements your EMM/MDM solution with a professional mobile print management system which covers all of your requirements. The print solution offers perfect printing support for any scenario and ensures productive mobile work thanks to Android and iOS printing to any printer and in any location. You’re on your way to a meeting, have your tablet or smartphone with you and would like to quickly print a presentation slide? No problem! ThinPrint’s mobile printing solution enables employees to use their iPad, iPhone, or Android device to print to corporate network printers. Users are always assigned the correct printers, i.e. those that are also available for the employee on their workstation computers. 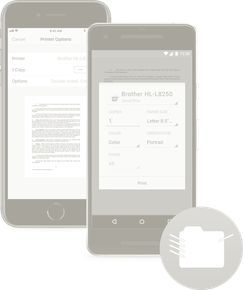 If employees want to print files from apps without built-in printing options, they simply share them with the ThinPrint Mobile Print app which then sends the files to the desired network printer. The print dialog provides you with a clear overview of settings such as page selection, color/black and white and duplex printing. Mobile printing to corporate printers works completely independent of the employees’ current location – they can also start printing remotely from outside the company (remote mobile printing). With the ThinPrint Mobile Print app, employees can print ad hoc via Wi-Fi, either in the company, at a partner’s office or customer’s premises as well as in the hotel lobby, in an airport lounge or in their home offices. For this form of mobile printing, all printers located in the same local network (Wi-Fi) as the mobile device from which the print job was sent, are suitable. Wi-Fi printing does not require any additional server settings or support for native iOS or Android printing technology. 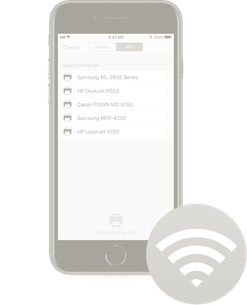 The ThinPrint Mobile Print app simply searches for printers on site to which users can then print from their iOS or Android devices via Wi-Fi. ThinPrint Mobile Print supports Apple’s native printing feature, providing comprehensive printing support for iOS devices. With native iOS printing, employees print their documents to any corporate printer, for example an e-mail directly from the e-mail app or a web page directly from the browser. No additional software needs to be installed. They can also use VPN to access corporate network printers when on the move and send a print job to their colleagues. macOS printing is also securely managed by ThinPrint Mobile Print, ensuring a native and seamless macOS printing experience for all MacBook users. 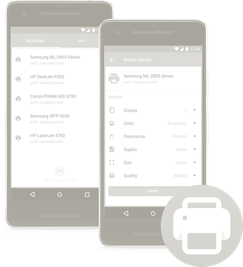 ThinPrint Mobile Print also offers comprehensive printing support for Android devices. That’s why Android smartphones or tablets allow employees to print from any app using the familiar native Google printing feature. In the app, the user sees all network printers that were previously assigned to him by the administrator. Employees also have the option of printing to a corporate printer via VPN while they are on the move. Flexible Integration with EMM solutions such as MobileIron, Airwatch & Co. Mobile devices in enterprise use require a secure EMM solution. Thanks to mobile device management (MDM), smartphones and tablets can be securely and productively integrated into the business. Mobile application management (MAM) provides employees with the necessary applications. ThinPrint Mobile Print enables mobile printing for MDM/MAM solutions such as Mobile Iron, Workspace ONE (Airwatch), Citrix XenMobile or BlackBerry (Good). ThinPrint’s close collaboration with leading MDM vendors ensures the seamless integration of mobile printing into any company-owned EMM system. This ensures that apps, data and devices of employees who are mobile and who print are securely managed via the MDM/MAM platform. No matter which form of mobile printing you choose, ThinPrint Mobile Print consistently ensures maximum print security. Since the network printers are assigned according to the existing Active Directory rights, employees on their iOS and Android devices only have access to the printers they choose from on their desktops. All print jobs are created on-premises behind the secure firewall and are SSL/TLS-encrypted when transferred from the mobile device to the ThinPrint Mobile Print server. ThinPrint’s integrated pull printing solution, Personal Printing, provides additional security. If required, employees can only collect a print job once they have authenticated their identity directly at the printer. To do so, they use their smartphone or tablet to scan a QR code on the network printer or identify themselves with a smart card to start issuing printouts. Request your Trial now or schedule a call with our experts!